The Conrad Manila has chosen TeleMatrix brand 9600 Series cordless and 3300 Series corded telephones for the iconic new hotel set to open in 2015. One of selected Conrad hotels by Hilton located in over 20 cities worldwide, Conrad Manila chose TeleMatrix 9600MWD5 single-line cordless and 3300MWD5 corded speakerphone models with 5 guest service keys, and matching 3300TRM Trimlines to be installed in the 347 hotel guest rooms. TeleMatrix 3300LBY lobby phone models were selected for deployment in the hotel lobby and common areas, which includes two floors of high-end retail stores and three state-of-the-art cinemas. 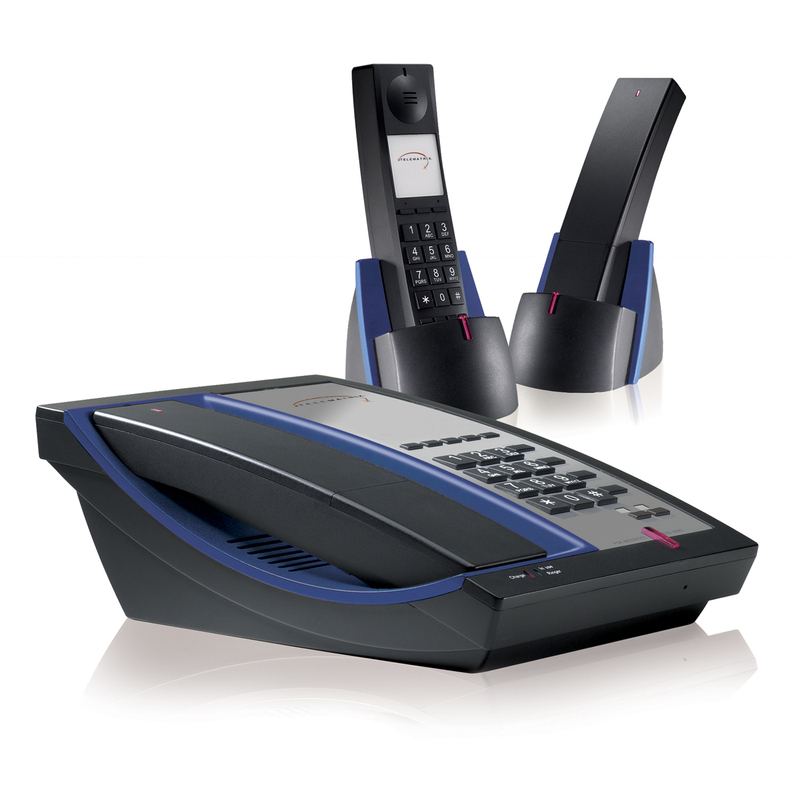 9600 Series cordless hotel phone with optional Blue color handset insert. Scheduled to open in 2015, Conrad Manila will be the iconic luxury hotel along the Manila Bay. With its distinctive architecture inspired by the big vessels that ply the bay, the hotel floats atop a high-end retail podium, like a mega yacht, making strong visual and experiential connections to the immediate waters of the bay in front, and the skyline of Makati Central Business District behind. 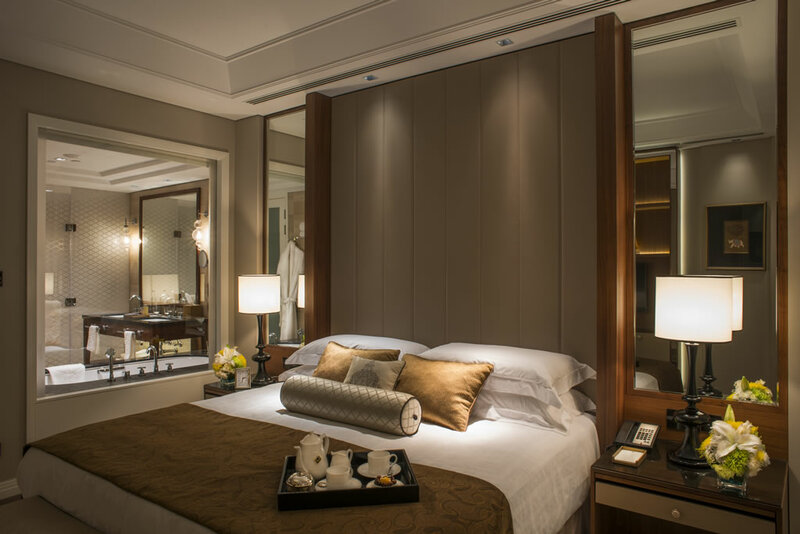 Conrad Manila will have 347 guest rooms, with a high proportion of suites to anticipate and meet the expectations of the growing number of seasoned business and leisure travelers. The hotel will have also have two ballrooms, meeting rooms, lobby and executive lounges, restaurants, an infinity swimming pool, and complete gym and spa facilities. Aligned with Conrad’s art inspirations, the hotel will feature contemporary international and local artworks - with a strong presence of the works of Filipino artists. Random accents in the guestrooms draw on the rich Spanish colonial heritage of nearby Intramuros and Manila. The 8-story structure will also house two floors of high-end retail stores, including three state-of-the-art cinemas. A dedicated sky park is planned on the roof deck with restaurants and amenities that offer a space to appreciate the panoramic views and spectacular sunsets of the Manila Bay. Taj Dubai guest room with TeleMatrix 9600 Series cordless and 3300 Series corded hotel phones. Taj Group has selected TeleMatrix 9600 cordless and 3300 corded hotel phones for it’s highly anticipated 296-room Taj Dubai hotel located in the prestigious Burj Khalifa downtown area. "We certainly applaud Taj Group designers for their masterful integration of TeleMatrix 9600 Series and 3300 Series telephone color handset accents to both complement and customize Taj Dubai guestroom décor,” states John Grubb, Vice President of Sales & Marketing, Cetis, Inc. "It’s a pleasure for both me, and our Cetis Middle East team to work with such a talented and committed hotel partner,” he concludes. Established in 1901, Taj Group is one of Asia's largest and finest group of hotels, comprising 112 hotels in 64 locations across India with an additional 16 international hotels in the Maldives, Malaysia, UK, USA, Bhutan, Sri Lanka, Africa and the Middle East. From world-renowned landmarks to modern business hotels, idyllic beach resorts to authentic Grand Palaces, each Taj hotel offers an unrivalled fusion of warm Indian hospitality, world-class service and modern luxury. For over a century, The Taj Mahal Palace, Mumbai, the iconic flagship has set a benchmark for fine living with exquisite refinement, inventiveness and warmth. An inspiring blend of sophisticated luxury, authentic Indian heritage and contemporary style, Taj Dubai is a world-class destination. Guests can enjoy awe-inspiring views of the world's tallest building and its magical dancing fountain from luxurious suites. Taking prime position overlooking the prestigious Downtown and Burj Khalifa precinct, the hotel is a five minute stroll from the city's dynamic business center and a myriad of exclusive shopping and fine dining experiences, including a short walk away from the Dubai Mall, a fashionista's paradise boasting over 1,200 stores and trendsetting venues. Marriott Annapolis Waterfront guestroom overlooking Chesapeake Bay. The Marriott Annapolis Waterfront Hotel in Annapolis, MD has selected Teledex E Series micro-footprint hotel phones for its 150 guest rooms. Located in downtown Annapolis on the Chesapeake Bay with views of the bay and Annapolis Harbor, the hotel selected Teledex E Series E100-4GSK single-line analog corded speakerphones that feature 4 programmable guest service keys and patented OneTouch voicemail retrieval. “OneTouch voicemail retrieval technology effectively eliminates calls to the front desk from guests who can’t access their voicemail messages, states John Grubb, Vice President of Sales & Marketing, Cetis, Inc. “And because it is intuitive, and easy-to-use, OneTouch voicemail also encourages guests to utilize the guest service keys on the in-room telephones, which can generate increased telecom-related revenue for hotel properties,” he concludes. Marriott Annapolis Waterfront Hotel is the only waterfront hotel in downtown Annapolis. 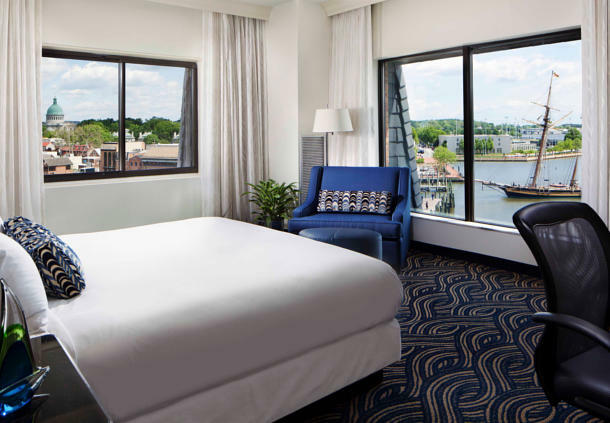 Enjoy stunning Chesapeake Bay and Annapolis Harbor views at the Marriott Annapolis Waterfront. Our hotel offers an unrivaled location directly on the water and boasts upgraded amenities; newly-renovated lobby, spacious remodeled guest rooms with modern technological conveniences and renowned high-touch service. Visit the new Teledex website at www.teledex.com. 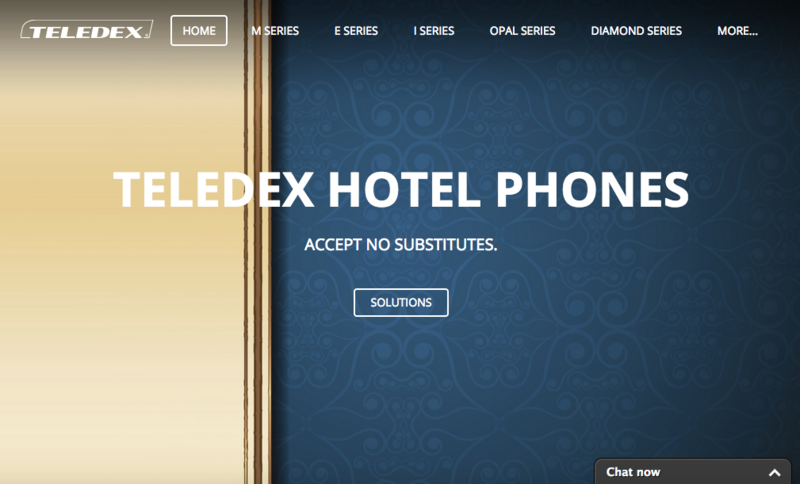 Take time to visit our new Teledex website at www.teledex.com and connect with our market-leading Teledex M Series, E Series, I Series, Opal Series, Diamond Series and Nugget Series hotel phones. The website features an elegant, colorful new look along with improved accessibility to view and download product and support documents, resource tools, product images, news, and videos. The new Teledex website also serves as a convenient portal for communications with the Teledex sales, support, and marketing teams. Visit the Connect page for contact information, or complete one of online forms to request quick responses to your questions, comments, quote requests, or buying inquiries. Click on the social media icons to connect with us on LinkedIn, Facebook, and Twitter. If you have any comments or suggestions regarding the new Teledex website, please write marketing@teledex.com, or visit the Support page and take a minute to answer our short survey on how we can better support your requirements. We look forward to connecting with you! 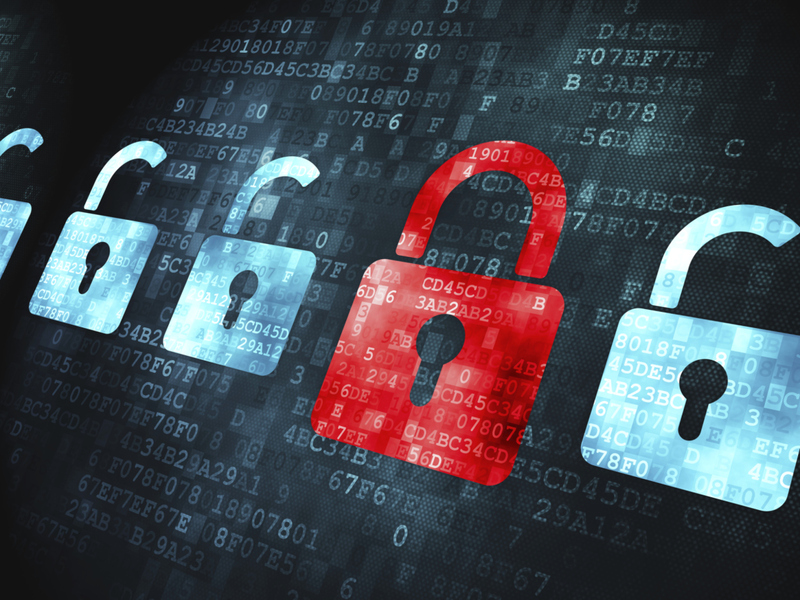 Tourism Tidbits: Tourism Security Challenges. Be aware of the lone wolf. Modern terrorism is often now an offshoot of what 14 years ago was called the single cell. Lone wolves are people who belong to no organization, are "radicalized" by information gained from a variety of sources and often are willing to give their lives for the "cause" even if they do not understand the cause for which they are dying. Although one lone wolf attack will most likely not hurt a tourism center, a number of these attacks in the same location will create the impression of a chronic problem. The twenty-four hour media may breed hysteria. There is simply too much time spent on too little. Because the media compete with each other to be the first with a breaking story, mistakes are made, and small incidents are often blown out of proportion. The media often give the impression that a place is far less safe than it really is and this impression hurts tourism. Furthermore, due to new overload most threats and dangers are soon forgotten. Although from a marketing perspective we do not want to dwell on threats to tourism's wellbeing, it is dangerous when those who are forced to protect tourism have also forgotten what might have take place only a few years ago. Click here to read the rest of the article at Hotel-Online. 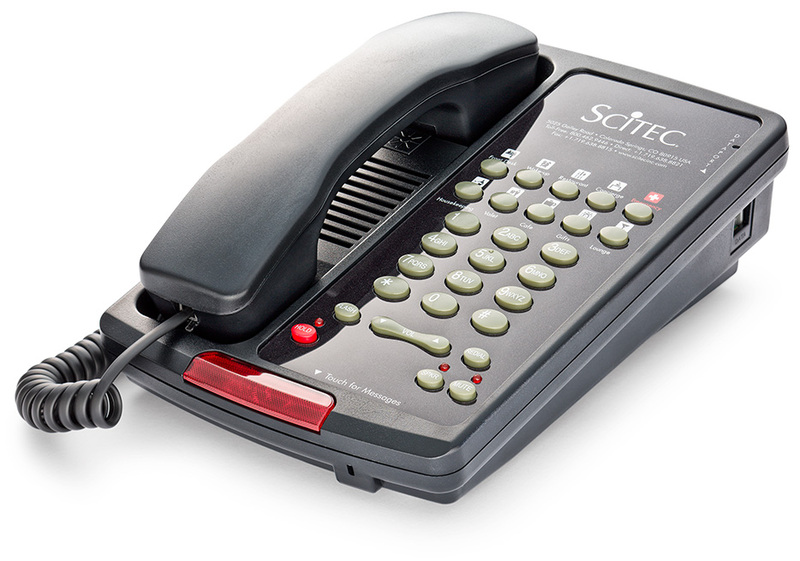 Scitec Aegis-T-08 two-line speakerphone with 10 programmable guest service keys. line? Information provided to Cetis by a major Los Angeles hotel reveals that Room Service orders totaled 54,400 in 2010 and over 65,000 in 2011. All were ordered on hotel guestroom phones, using single button pushes. Imagine, for example, that the average room service order totals $20. 65,000 calls at $20 equals $1.3 million dollars in room service orders. $1.3 million annually at just one hotel - all thanks to that convenient single button push on a hotel Cetis guestroom telephone! Ready to learn more? Click here for additional details, and order Cetis hotel phones with programmable guest service keys for your properties. Do you have emergency phones in place throughout your hotel properties to meet existing brand standards, and to protect your guests and staff in the event of an emergency? The guest room telephone is uniquely designed to serve as an emergency contact point and location device inside the room, but are you prepared to meet the emergency communications needs of guests, hotel staff, and visitors in hotel common areas when time matters most? Be prepared. Contact your Cetis sales representative for emergency phone product and pricing details. Because most hotels charge for anything that is consumed or misplaced from the minibar, always remember that any items you take from the minibar will appear on your bill at checkout.